San Diego mayor Kevin Faulconer unveiled one of the most aggressive--and comprehensive--approaches in the state for tackling his city’s growing housing affordability crisis on Wednesday, following up on a pledge earlier this year to address rising prices by accelerating housing approvals and expanding supply. Faulconer’s housing package includes a dozen different proposals for bringing building costs down--and getting more homes built more quickly. Many of these ideas first emerged in a 2015 San Diego Housing Commission study and have been working their way through the City Council’s Smart Growth and Land Use Committee this spring. Faulconer’s call to arms may not sound that dissimilar from the rhetoric emerging from other parts of the state, as rising prices make living in California increasingly unaffordable. But the San Diego mayor’s framing of the problem—and the solutions the city is developing with a unique coalition of business associations, labor groups, environmentalists, and builders—are fundamentally different. The mayor’s proposals, which Faulconer said he hoped to see implemented over the next year, include specific code amendments to streamline the development review process, provide greater incentives to builders to develop denser projects with below-market units, and change municipal rules to make it easier for existing homeowners to build second dwellings on their property. The mayor has also prioritized increasing funding for low-income housing and revising parking standards to lower development costs. Among the mayor’s most far-reaching ideas is a provision to allow projects to take advantage of existing CEQA streamlining processes in infill areas. The package also includes plans to reduce the impact of developer fees, calling for a revised methodology based on square footage, instead of the number of units in each proposed development. Perhaps most importantly, the mayor has also asked the city to begin providing an annual report on the city’s housing inventory. “What gets measured gets managed,” as a fact sheet released by the mayor’s office puts it. “Currently, the City of San Diego does not do a comprehensive report of its housing inventory and greater housing outlook.” In his housing plan, the mayor calls for a report of existing inventory, the number of units approved, as well as vacancy rates and other metrics—all beginning this summer. 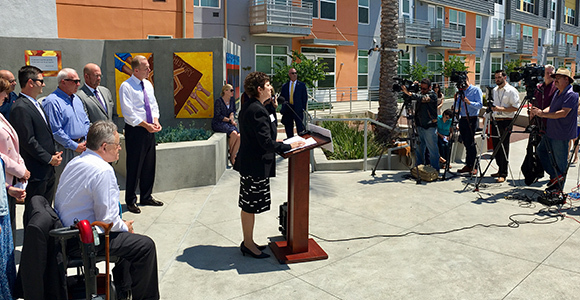 Faulconer’s actions, many of them derived from years of work by other local leaders, are drawing praise from across the broad coalition that has emerged in the last few years to push for solutions to the city’s housing crisis. While selling the mayor’s proposals across the sometimes growth-wary region remains a political challenge, Mary Lydon, executive director of the Housing You Matters coalition, believes the foundation has been laid locally to achieve something few other big cities in California have accomplished: Moving ahead with a major new push to increase housing supplies.